EACO Corp. is a small but rapidly-growing distributor of fasteners and electronic components to a large variety of industries. The company has 43 sales offices and 6 distribution centers across the US. EACO Corp. conducts its activities through its subsidiary Bisco Industries, Inc., which it acquired in 2005. Prior to acquiring Bisco Industries, EACO Corp. operated restaurants in the state of Florida. Results were abysmal. In 2005, the company sold off all its operating restaurant properties, retaining the workers compensation liabilities associated with them. The company also retained five properties held for lease in California and Florida. In 2010, EACO Corp. executed an agreement to purchase Bisco Industries, a private company owned entirely by Glen F. Ceiley. Pursuant to the agreement, EACO executed a reverse split and then issued 4.706 million shares to Glen F. Ceiley, as well as 36,000 shares of cumulative convertible preferred stock. Before the reverse split, EACO had 3.91 million shares outstanding. After the 1-for-25 reverse split, only about 156,000 shares remained. Issuing the 4.706 million new shares to Glen F. Ceiley resulted in him owning 96.8% of the company. The transaction was effectively a reverse merger, where a much larger company merges into a smaller or shell company in exchange for nearly all the equity of the combined enterprise. According to basic KPI theory, reverse mergers can be a cost-effective way for a private company to achieve a public listing. Since 2010, Mr. Ceiley has built his stake in EACO Corp. to 98.7%. Other executives own another few hundred shares, leaving a float of only 62,211 shares, or 1.3% of shares outstanding. I have no data to prove it, but I am convinced EACO Corp. must have one of the smallest, if not the actual smallest float of any company that trades in the US. The value of the float is a mere $145,000. Even the smallest of value funds is likely to pass on EACO. Float makes little difference, except at extremes. Whether a company has 10% or 90% of its shares in the hands of the public does not affect its revenues, earnings or cash flows one whit. However, a low float often indicates concentrated share ownership, which increases the power of insiders or significant outside investors to influence a company’s decision-making. With an ownership of 98.7%, Glen F. Ceiley has carte blanche to manage EACO and Bisco Industries however he sees fit. Fortunately, EACO has done extremely well under Mr. Ceiley’s leadership. Since 2010, revenues are up 26.8% and has moved from making losses to earning significant profits and free cash flows. Revenues include a small figure from the company’s remaining leased properties. Distribution sales from Bisco Industries accounted for 99% of revenues in fiscal 2012. 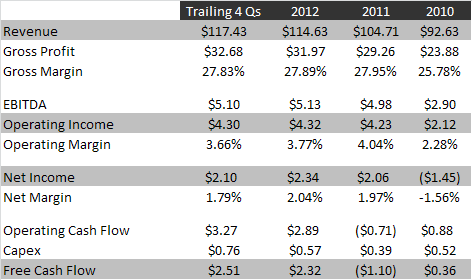 With gross margins of nearly 28%, it’s somewhat surprising that operating margins register below 4%. Officer compensation is very reasonable at less than $1 million in 2011, so that is not the issue. EACO does not release much detail regarding operating expenses, but I suspect that sales commissions and salaries account for most of the overhead. Being a distributor, EACO depends on Bisco’s sales force to sign up new accounts and grow the business. Talented salespeople do not work for cheap. In the most recent quarterly report, EACO noted its sales staff headcount increased 10% from a year early, by 26 people. That equates to 260 sales people across the nation and an average of about $450,000 in sales for each. 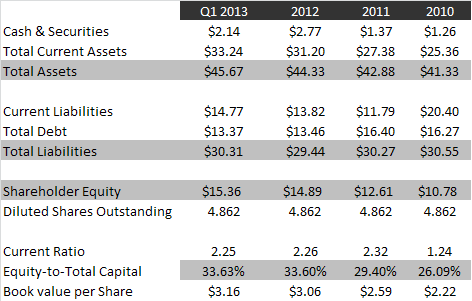 EACO Corp. has good liquidity, but carries a substantial amount of debt. Net debt of $11.23 million is 2.2 times trailing EBITDA. While I would like to see less debt on the balance sheet, my concerns are put to rest by the fact that the debt balance is declining and the company is becoming less leveraged as time goes by. The line of credit with Community Bank accounts for over half of EACO’s total debt and carries a very reasonable (floating) interest rate. The line of credit is personally guaranteed by Glen F. Ceiley. The Symlar Properties note with Community Bank is backed only by the company’s leased Symlar, California properties. In January, the company announced the sale of a property in Orange Park, Florida for $1.07 million. The sale is expected to finalize by late March. This property had been listed on EACO’s balance sheet as held-for-sale and has no debt against it. 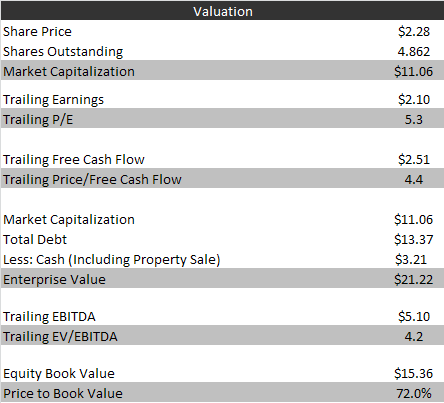 Despite its Bisco subsidiary’s 10%+ annual growth, EACO trades at just over 5 times earnings and at 72% of book value. If EACO can continue its success, the math could work out well for shareholders. If EACO grows at 8% annually for the next five years and then trades at 10 times forward earnings, shares would be worth $6.86, good for 25% annual returns. Investors should remember that EACO is effectively a one-man show due to Mr. Ceiley’s extraordinarily high ownership. What I can’t understand is why he took over the company at all. He was already running a highly successful, growing private business. Why bother with the hassles of public ownership like quarterly reporting and investor communications, especially when less than 2% of all shares will be held by the public? Perhaps he had or has ambitions of raising additional capital through share sales and conducting acquisitions. Mr. Ceiley is 66 and will eventually want to step back from the business. It could be 20 years from now, but at that point I would expect a sale to a competitor. Due to the tiny size of EACO’s float, investors will have a tough time accumulating any meaningful stake in EACO. On the other hand, returns are returns and picking up a few shares here and there could potentially result in significantly greater worth down the road. Disclosure: I own shares in EACO Corp.
Looks cheap. When I see one guy with this much control it’s either really great if he is competent and ethical, or really awful if he isn’t. Have you been able to find any background info on Mr. Ceiley that would give us a hint as to which category he fits in? I have not been able to find a lot of information on Glen F. Ceiley. I agree with you about the issue of reputation and trustworthiness. The fact that Mr. Ceiley’s compensation is reasonable and EACO’s shares outstanding have not increased at all since the transaction are marks in his favor. The company is doing nearly twice the sales it did in 2005. Operationally, the company’s results have been solid. The company does have an unfortunate habit of gambling with marketable securities, but the size of that portfolio has been wound down greatly since it suffered big losses in 2009. My guess is that he invested in the eatery business expecting it to fall flat on it’s face. On the filing (received by the SEC 12.23.09), they made a pro forma tax asset adjustment of 4.165 million. Why maintain a SEC filing company? This baffles me. At a minimum, you’d think they would withdraw their SEC filing status and just go pink sheets. They have more than 300 shareholders…. so some sort of reverse split would have to happen to get them under that number. It is possible that they may merge again with a worthless company to take advantage of NOL’s in the future…. being an SEC filer probably helps facilitate that. Nice find…. I love finding hidden value in companies like this. Not sure I will be able to establish much of a position though. Thank your for bringing this company to our attention and for your thoughtful evaluation. I will add a few points that I believe are correct based on my readings of old filings. Mr. Ceiley was the chairman of both EACO and Bisco and while Bisco, a private company, has done well under his guidance, EACO has not done well at all. He merged the companies, I imagine, to take advantage of NOLS and public stock registration for BISCO as EACO was about to be worthless on its own. So he seems to be very good at leading Bisco but not very good at leading EACO prior to joining with Bisco. His ability to invest in stocks is questionable as he has often sold for a loss. Currently, he holds a short position of 700,000 or thereabouts, along with 500,000 in securities. I wonder what he decided to short. If he is short a currency to match up against foreign sales then that would seem reasonable. Otherwise, he is simply doing more investing with company money (his money) despite the presence of 13 million in total debt. I’d rather he paid down the debt more. The preferred shares have a liquidation value of $900,00o and pay 8.5% per year. While they are only convertible into 40,000 shares of EACO, I doubt they will ever be converted. Therefore, when valuing the company I would recommend considering the preferred shares as being like a callable note with a liability of $900,000. Your point about Mr. Ceiley’s longer-term record with EACO is valid. Truly an awful performance before the BISCO merger. I also wish Mr. Ceiley would quit using the company as his personal trading account. While he’s a good businessman, he’s not much of a trader and the gains and losses (and it’s mostly losses) add unnecessary noise to the company’s results. From an analytical perspective, you are correct. Those prefs will never be converted and treating them as a note is the way to go. Unfortunately, the expense associated with those will be assessed against after-tax dollars. Just wanted to thank about this post. I have made a lot of money on this one thanks to you. At $2 and change this was steal but mow is fairly valued. I was able to sell some since the stock is very illiquid. Glad you made some money. So have I. Never thought I would see the stock at these levels. Sooo what’s going on here? $18.50 down to $4.50 the past few days? Short answer: EACO has the smallest float of any stock I have ever seen, and 10% of the float has already traded today. This is momentum players heading for the exits as fast as they can. For what it’s worth, I think EACO is a spectacular buy here. This price is under 4x EBIT for a healthy and growing business.